There are LOTS of great things about getting older. You stop caring so much about what other folks think. There’s far less drama in your life. Let’s not forget those senior discounts. And, of course, the big one… retirement. But one thing that’s FAR from great is that your risk for type 2 diabetes gets significantly higher. After 45 your risk starts to rise. In fact, folks age 45 to 64 are the most diagnosed group for the disease. And by the time they pass 65 at least 40 percent of Americans have type 2 diabetes. The main reason for the rise in risk isn’t really a mystery either. Most of us soften up as we age, losing muscle mass and gaining weight. Don’t feel bad, it happens to the best of us. And besides, it’s NOT your fault. According to Yale researchers, even if you’re a healthy senior, the mitochondrial activity in your muscles drops by about 35 percent. And that drop is linked to a 30 percent INCREASE in fat in your muscle cells… and the insulin resistance to go with it. In other words, if you’ve managed to avoid diabetes up until this point, that’s fantastic. But you may be living on borrowed time. And there’s no better time than NOW to start thinking about reducing your risk BEFORE you end up its next victim. The solution is surprisingly simple. You need to make a move to reduce your risk. And yes, that DOES mean getting more exercise, rather than less, as you age. Don’t panic. It’s true that the more you unseat your seat, the lower your risk for type 2 diabetes will be. But reaching the optimal amount of muscle mass won’t take nearly as much effort as you fear. Most folks think they need to be able to bench press 135 pounds or run for 10 miles to make a meaningful dent in their type 2 diabetes risk. But they’re wrong. In fact, scientists now have proof of what it ACTUALLY takes. And it’s going to blow you away. For the new study, published in the journal Mayo Clinic Proceedings, researchers recruited 4,500 adults. Each completed chest and leg presses to measure muscle strength. The numbers were then adjusted for age, gender, and body weight. And the University of Iowa scientists confirmed that building muscle strength can send your risk for diabetes plummeting. But their research also revealed you don’t have to have the muscles of a weight-lifting gym rat to reduce your risk. In fact, it was MODERATE muscle mass that hit the sweet spot. The folks with moderate muscle mass had a 32 percent reduced risk for type 2 diabetes. While those volunteers who had a lot MORE muscle didn’t have any extra advantage. 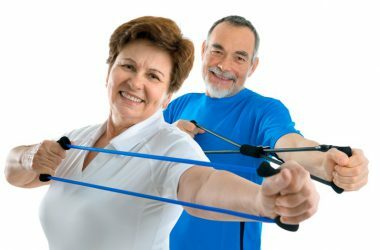 After age 60 we lose about three percent of muscle strength a year. So it’s essential to get started on protecting and building yours right away. A variety of things can contribute to muscle strength. But resistance training is vital. So aim for at least two resistance sessions a week to build muscle mass and help reduce your OWN diabetes risk. Resistance bands and exercise machines like you’ll find at the gym are a simple and effective way to get started. And strapping on light ankle or wrist weights on while you do your chores or walk the dog is an easy way to add a bit of light resistance to something you’d be doing anyway. Don’t let borrowed time turn into TOO LATE. Make a move to build your muscle mass and slash your diabetes risk starting TODAY.